GM Announces Cuts At Car Assembly Plants In Michigan, Ohio, Canada As part of a major restructuring that will prioritize GM's electric and autonomous vehicle programs, the automaker plans to cut 15 percent of its workforce to save some $6 billion by the end of 2020. General Motors says it plans to cease production of some models at three vehicle assembly plants in the U.S. and Canada in 2019. It also plans to cut production at two plants in the U.S. that make transmissions. The company said the moves are part of an effort to cut 15 percent of its workforce. It's part of a major restructuring that will prioritize the company's electric and autonomous vehicle programs. The decision, announced Monday, will impact Detroit-Hamtramck Assembly in Detroit, Lordstown Assembly in Warren, Ohio, and Oshawa Assembly in Oshawa, Ontario. Two transmission plants — one in White Marsh, Md., and another in Warren, Mich. — are also set to stop production. The company said it plans to halt production of the Chevrolet Cruze at the Lordstown plant in March. In Detroit, it plans to halt production of the Buick LaCrosse and Chevrolet Volt in March and the Cadillac CT6 and Chevrolet Impala in June. In Ontario, it plans to halt production of the Chevrolet Impala and Cadillac XTS by the final quarter of 2019. "These tend to be the lower-margin vehicles," GM Chief Financial Officer Dhivya Suryadevara told reporters. The company says 5,901 hourly employees and 804 salaried employees work at these plants. "We are announcing the cessation of certain products resulting in a number of plants being without allocated volume to produce," GM spokesperson Julie Huston-Rough told NPR. She added that shutting down or closing a plant is an issue that must be discussed in negotiations with the United Auto Workers. GM Chairman and CEO Mary Barra said the company is aiming to cut executive positions by 25 percent, as part of its overall push to cut it workforce. "We will achieve this through a combination of voluntary and involuntary programs," she said. GM added that it expects to save some $6 billion by the end of 2020. UAW Vice President Terry Dittes called it a "callous decision" that would be "profoundly damaging to our American workforce." "The UAW and our members will confront this decision by GM through every legal, contractual and collective bargaining avenue open to our membership," the union said in a statement. President Trump told reporters, "We don't like it; I believe they'll be opening up something else." He added that he's "not happy" about the announcement. The communities impacted by the decision are digesting the news. "They told me straight up there's nothing we can do," Ontario Premier Doug Ford told lawmakers, according to the CBC. He called the decision "absolutely devastating," and the broadcaster reported that thousands of workers at the Ontario plant stopped working Monday. As Michigan Radio reported, Detroit Mayor Mike Duggan called the news "troubling" and said that the union and local officials are "working together to come up with a solution that works for GM and the employees." Ohio politicians have also responded to the announcement. Arno Hill, the mayor of Lordstown, told NPR that he received a call from GM to inform him of the decision about five minutes before the news was released to the public. "Everybody's very downhearted," he said. "They know they're making a great product ... but they also realize that the car is not selling, and, you know, the key is to get another product for this plant." 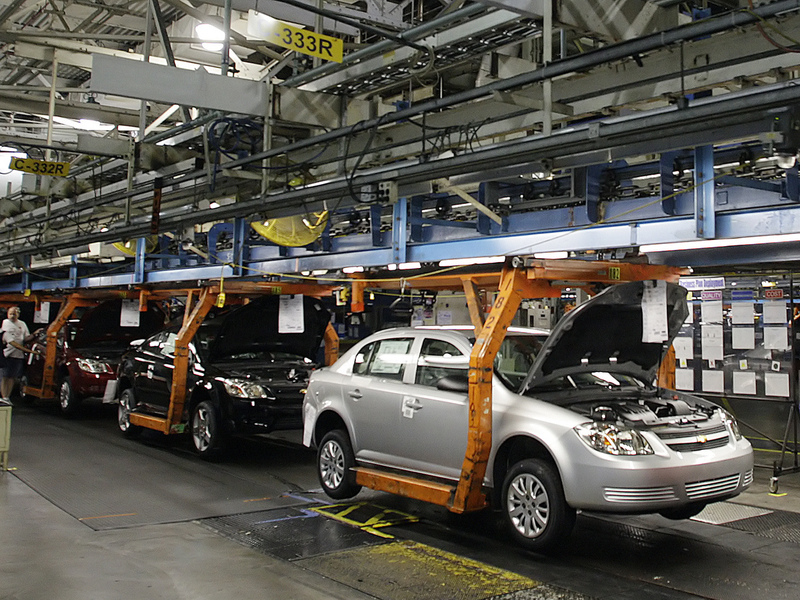 "GM owes the community answers on how the rest of the supply chain will be impacted and what consequences its disastrous decision will have on the Mahoning Valley and our state," Ohio Sen. Sherrod Brown said in a statement. Ohio Gov. John Kasich called it "painful to see this happen to the plant's workers," noting the plant had been working with GM for more than 50 years. Barra explained that GM is restructuring now, "while the company and the economy are strong, to stay in front of a fast-changing market." That sentiment, as NPR's Jim Zarroli reported, is paired with a widespread expectation that the economy will slow down next year. He adds that there are also big questions about trade and rising interest rates. "So there are just a lot of questions about where the market is going, whether sales have peaked," Zarroli reported. "I think GM is just trying to sort of get ahead of what it sees as an inevitable downturn."